The GamesJunkie Start is a Google Chrome extension which falls under the category of potentially unwanted software. It affects web-browsers and imposes changes to its settings like home page, new tab page and search provider by default. It’s currently very active spreading on the Internet. Many users have problems with cleaning a personal computer from GamesJunkie Start extension and restoring the Google Chrome and other internet browsers settings. Now, computer geeks and Myantispyware lab have teamed up to create a free tutorial that allow users get rid of GamesJunkie Start extension for free. Except that the GamesJunkie Start modifies browser’s homepage and newtab page, it also rewrites your search provider, which leads to the fact that use of the internet browser’s search becomes uncomfortable. The reason for this is that the search results will consist of lots of ads, links to unwanted and ad pages and only the remaining part is search results for your query from well-known search providers like Google or Bing. And finally, the GamesJunkie Start plugin may collect a wide variety of personal information about you like what web-pages you are opening, what you are looking for the Net and so on. This information, in the future, can be sold to third parties. So, it is very important to free your system of this extension as quickly as possible. The steps, which is shown below, will help you to remove GamesJunkie Start addon from the Google Chrome and other web browsers for free. The answer is right here on this page. We have put together simplicity and efficiency. It will help you easily to clean your personal computer of plugin. Moreover, you can select manual or automatic removal way. If you’re familiar with the system then use manual removal, otherwise run the free anti malware tool created specifically to remove addon such as GamesJunkie Start. Of course, you can combine both methods. Certain of the steps will require you to restart your computer or close this web-page. So, read this guide carefully, then bookmark or print it for later reference. Read this section to know how to manually remove the GamesJunkie Start addon. Even if the guidance does not work for you, there are several free malware removers below which can easily handle such browser hijackers. In order to remove GamesJunkie Start, first thing you need to do is to remove unknown and suspicious programs from your PC system using Windows control panel. When removing this add-on, check the list of installed software and try to find suspicious programs and delete them all. Pay special attention to recently installed applications, as it is most probably that the GamesJunkie Start addon сame along with it. It will display a list of all software installed on your machine. Scroll through the all list, and uninstall any suspicious and unknown programs. 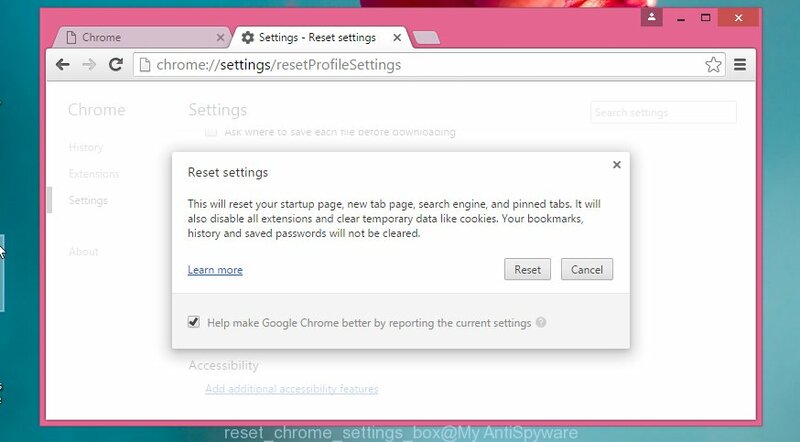 Reset Chrome settings is a simple way to remove the addon, malicious and adware extensions, as well as to restore the web-browser’s start page, newtab and search provider by default that have been replaced by extension. Use potentially unwanted software removal tools to get rid of GamesJunkie Start automatically. The free software tools specially created for addon, adware and other potentially unwanted programs removal. These tools can get rid of most of extension from Google Chrome, Internet Explorer, FF and Microsoft Edge. Moreover, it can remove all components of unwanted software from Windows registry and system drives. Zemana AntiMalware (ZAM) highly recommended, because it can scan for security threats such ad-supported software and add-ons which most ‘classic’ antivirus programs fail to pick up on. Moreover, if you have any GamesJunkie Start extension removal problems which cannot be fixed by this utility automatically, then Zemana Anti Malware (ZAM) provides 24X7 online assistance from the highly experienced support staff. After downloading is finished, close all software and windows on your computer. Double-click the setup file called Zemana.AntiMalware.Setup. If the “User Account Control” prompt pops up as on the image below, click the “Yes” button. It will open the “Setup wizard” which will help you set up Zemana Free on your computer. Follow the prompts and don’t make any changes to default settings. Now click the “Scan” button to perform a system scan for the GamesJunkie Start addon that modifies your home page and search provider. A scan can take anywhere from 10 to 30 minutes, depending on the number of files on your computer and the speed of your PC system. While the Zemana program is checking, you can see how many objects it has identified as threat. Once the scan is done, the results are displayed in the scan report. In order to delete all threats, simply click “Next” button. The Zemana will remove GamesJunkie Start addon which cause a redirect to an unwanted web site. After disinfection is complete, you may be prompted to reboot the PC system. Remove GamesJunkie Start extension manually is difficult and often the extension is not completely removed. Therefore, we recommend you to run the Malwarebytes Free that are completely clean your computer. Moreover, the free application will allow you to remove malicious software, potentially unwanted programs, toolbars and ad-supported software that your PC system can be infected too. Please download MalwareBytes Anti-Malware (MBAM) from the following link. Save it on your Desktop. Once the downloading process is complete, please close all software and open windows on your PC. Double-click on the icon that’s named mb3-setup. This will run the “Setup wizard” of MalwareBytes Anti Malware onto your computer. Follow the prompts and don’t make any changes to default settings. Further, click the “Scan Now” button to start checking your PC system for the GamesJunkie Start extension that cause a reroute to an unwanted web-page. A scan can take anywhere from 10 to 30 minutes, depending on the number of files on your system and the speed of your personal computer. While the MalwareBytes is checking, you can see number of objects it has identified either as being malware. When MalwareBytes Anti Malware has completed scanning, the results are displayed in the scan report. You may move threats to Quarantine (all selected by default) by simply click the “Quarantine Selected” button. After that process is done, you may be prompted to restart the personal computer. AdwCleaner is a free removal tool that can be downloaded and use to remove hijacker infections, ad-supported software, malware, potentially unwanted programs, toolbars and other threats from your machine. You can use this utility to scan for threats even if you have an antivirus or any other security application. In the AdwCleaner window, click the “Scan” to perform a system scan with this tool for the GamesJunkie Start plugin and other security threats. A scan can take anywhere from 10 to 30 minutes, depending on the number of files on your personal computer and the speed of your computer. When a threat is detected, the count of the security threats will change accordingly. Once AdwCleaner completes the scan, you can check all items detected on your personal computer. All found items will be marked. You can remove them all by simply click “Clean”. If the AdwCleaner will ask you to restart your computer, click “OK”. In order to increase your security and protect your PC against new annoying advertisements and harmful web sites, you need to use ad-blocker application that blocks an access to malicious ads and web sites. Moreover, the application can block the open of intrusive advertising, that also leads to faster loading of web sites and reduce the consumption of web traffic. Once the download is complete, run the downloaded file. You will see the “Setup Wizard” screen as displayed in the figure below. In most cases, the default settings are enough and you do not need to change anything. Each time, when you start your PC system, AdGuard will start automatically and stop advertisements, GamesJunkie Start redirect, as well as other harmful or misleading sites. For an overview of all the features of the program, or to change its settings you can simply double-click on the AdGuard icon, which is located on your desktop. Now your computer should be free of the GamesJunkie Start extension and other security threats. Remove AdwCleaner. We suggest that you keep AdGuard (to help you block unwanted popup ads and unwanted harmful sites) and Zemana AntiMalware (ZAM) (to periodically scan your personal computer for new add-ons and other malicious software). Probably you are running an older version of Java or Adobe Flash Player. This can be a security risk, so download and install the latest version right now. If you are still having problems while trying to delete GamesJunkie Start add-on from the Google Chrome, Firefox, Edge and Microsoft Internet Explorer, then ask for help in our Spyware/Malware removal forum.